Electric starter motors or starting motors are extensively used in several gasoline and diesel engines. They have become integral units of modern-day automobiles and are fixed in as permanent magnets or a series parallel wound direct current electric motors that have a starter solenoid on top like a relay. The unmatched production of automobiles across the world is the primary reason for the growing demand for automotive starter motor and alternators. According to the research report, the global automotive starter motor and alternator market is expected to be worth US$ 38.56 bn by the end of 2024 as compared to US$27.35 bn in 2015. During the forecast period of 2016 and 2024, the global market is expected to expand at a CAGR of 3.9%. The global automotive starter and motor alternator market has been thriving due to the stupendous growth of the automotive sector across the globe. The positive changes in economies since the global slowdown have also had a significant impact on the overall market. The market is also benefitting from the rising investments and mergers and acquisitions of several leading companies. These factors have helped companies improve their research activities, make value addition to their existing pipelines, and expand their geographical reach. Analysts anticipate that the overall market will also profit from the adoption of automotive starter motors and alternators for several hybrid and electric vehicles. In terms of regions, the global market is segmented into Europe, North America, Asia Pacific, the Middle East and Africa, and Latin America. The report indicates that Asia Pacific will hold a dominant share in the global market due to emerging economies and rapid industrial development. The growth of automobile manufacturing and consumption across Asia Pacific has also had a positive impact on the overall market. The other key regional markets for automotive starter motor and alternators are Latin America and the Middle East and Africa. The growing demand for passenger vehicles with rising standard of living and improving disposable incomes has triggered a major demand for these vehicle components in the aforementioned regions. The various types of starter motors available in the global market are pneumatic, electric, hydraulic, and others. Of these, the electric starters are the most popular ones. The various types of electric starters used in vehicles are the gear reduction, folo-thru drive, inertia starter, and moveable pole shoe. However, analysts predict that the growing sales of electric and hybrid vehicles are likely to initiate a technological change in the global market. The types of alternators studied in the research report are claw pole alternator and cylindrical alternator. Out of these, the claw pole alternator segment will gain a dominant share in the overall market. Their ubiquitous adoption in all types of vehicles such as light commercial, heavy commercial vehicles, and passenger vehicles will ensure the segment’s dominance in the coming years. The key players operating in the global automotive starter motor and alternator market are Mitsubishi Electric Corporation, Lucas Electricals, Ltd., Valeo Group, Denso Corporation, Mitsuba Corporation, The Bosch Group, Hella KGaA Hueck & Co., Controlled Power Technologies Ltd., ASIMCO Technologies Ltd., Cummins, Inc., and Hitachi Automotive Systems, Ltd.
A starter motor in an automobile is one of the most vital component. It is an electric motor, which ignites the engine to start. It comprise of direct current electric motor and a starter solenoid. The starter motor is powered by the battery of the car and to turn over the engine, it requires very high electric current, which comes from the battery. On the other hand, automotive alternators are components in automobiles, which charges the battery and powers the electrical systems when the engine is running. 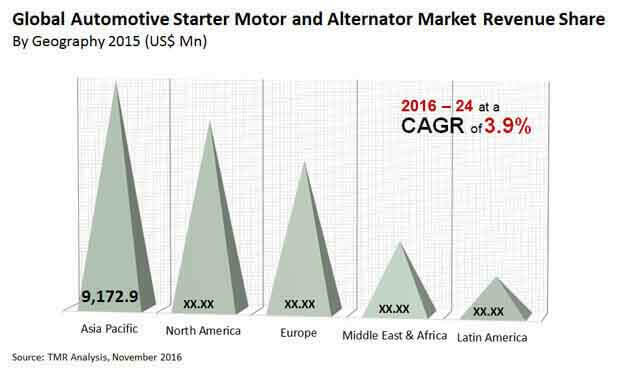 The global automotive starter motor and alternator market is fragmented with few medium and large companies. Entry into this market is not restricted as there is no monopoly of business and the market has huge scope and opportunity. However, setting up of manufacturing units for automotive starter motors and alternators require huge capital and resource, which is not feasible for most of the small and medium sized companies. Increasing private equity investments and merger and acquisitions of companies in the automotive sector has been of great influence to the automotive starter motor and alternator market. In addition, application of automotive starter motors and alternators in new segment of vehicles such as hybrid and electric vehicles is also set to drive the market for automotive starter motor and alternator across the world. Significant growth in the automotive sector coupled with economic reforms in major developing countries has been able to bolster the growth of this market. Asia Pacific, Middle East and Africa, and Latin America are key markets for the future and are expected to provide huge opportunities to the global automotive starter motor and alternator manufacturers because of the growth in the automotive sector and increasing demand for passenger vehicles in the regions. Moreover, in the past five years, there has been an increasing production of vehicles globally because of the rising demand and usage of passenger vehicles. This in turn is driving the demand and growth of starter motors and alternators used in the production of automobiles. The market is segmented on the basis of geography into Europe, North America, Asia Pacific, Middle East and Africa (MEA), and Latin America. These segments have been estimated in terms of revenue (USD million). In addition, the report has been segmented based on starter motor types, which includes, electric, pneumatic, hydraulic and others. Moreover, the report is also segmented by alternator type that includes claw pole alternator and cylindrical alternator. For better understanding of the automotive starter motor and alternator market, the study comprises market attractiveness analysis, where the starter motor types are benchmarked based on their market scope, growth rate and market attractiveness. The report also provides company market share analysis of the various industry participants. Acquisition is the main strategy being widely followed by leading market players. In case of an acquisition, the acquirer takes advantage of existing synergies. As a result, both companies are expected to emerge more profitable and stronger than before. Key players in the global automotive starter motor and alternator market have been profiled and their company overview, financial overview, business strategies and recent developments have been covered in the report. Major market participants profiled in this report include: Valeo Group, Denso Corporation, The Bosch Group, Mitsuba Corporation, Mitsubishi Electric Corporation, Lucas Electricals, Ltd., Controlled Power Technologies Ltd., Hella KGaAHueck& Co., ASIMCO Technologies Ltd., Hitachi Automotive Systems, Ltd. and Cummins, Inc. The report provides a cross-sectional analysis of by starter motor type and of by alternator type segment with respect to the above mentioned regions.